A long, long time ago, before I knew what I know now, I was pretty confident that I could recreate any recipe I'd ever tasted. I'll admit that I was pretty good at deciphering flavors and identifying herbs and spices. That worked pretty well when I was making soup or a stew or a salad or an herb-crusted steak. It didn't work so well when I tried to make enchiladas. It wasn't completely my fault. I was actually doing fairly well until I put the pan of enchiladas in the oven to melt the cheese. And then I dozed off on the couch. When I took the enchiladas out of the oven, the melted cheese looked good ... but the tortillas had turned to mush. It was pretty awful. Those enchiladas were my first complete failure, and I learned a lot, but the most important lesson was that it's a good thing to use a reliable recipe the first time I'm making a new dish with ingredients I'm not familiar with. These days, I know how to make my own tortillas. Back then, they were still very new to me. Fast-forward to today, and I have in my hands The Great Pepper Cookbook from Melissa's, who sent me both the cookbook and a small container of habanero peppers. When I got the book, I browsed through the recipes to see what I could make and when I arrived at the page for Chicken Enchiladas, I knew I had to make them. And, lucky for me, the recipe called for a habanero pepper. Well, it called for a red habanero, and I had orange ones, but I figured it was close enough. Since I removed the seeds and ribs from the pepper I used, the resulting sauce wasn't super-hot. If you want a hotter sauce, you can add more pepper, or include some of the seeds and ribs. Not only is this a book for cooking with pepper, but there's also a short section in front that describes various types of peppers and how hot they are. This is particularly handy if you want to substitute one pepper for another - you'll know which ones have a similar heat level, so you can make wise substitutions. There's also a handy page that explains how to prepare dried peppers. Although peppers can be hot, this isn't a book that's all about heat. There are plenty of recipes that use milder peppers. And remember that part about making substitutions - yep, you can certainly use these recipes and swap out milder peppers if you aren't a fan of heat. 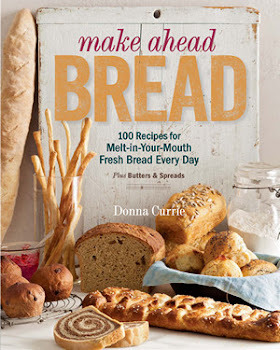 The book has everything from appetizers to drinks to main dishes ... and even desserts. Something for everyone. I'm looking forward to summer, when I can try one of the corn chowder recipes and some of the crunchy salads, but the next on my list might be the beer, cheese, and pepper soup. Perfect for a chilly day. As much as I like peppers, I have to say there are recipes here where I might never have thought of adding peppers. I'm gonna have some fun! When you're prepping the vegetables, you don't need to be very precise - you'll be blending the sauce later. You don't want giant chunks of onion, but this isn't a time when anyone's going to notice your knife skills. In a straight-sided saute pan, melt the butter, then add the onion and cook over medium-high heat until the onions are soft. Stir in the broth, cumin, oregano, salt, tomatoes, and pepper. Bring to a boil, then lower to a simmer and cook for 15 minutes. Add the chicken to the sauce and bring the mixture to a boil, then lower to a simmer. Continue cooking until the chicken is cooked through and the internal temperature reaches 165 degrees - about 30 minutes. Remove the chicken from the pan and let it cool slightly, then shred it. 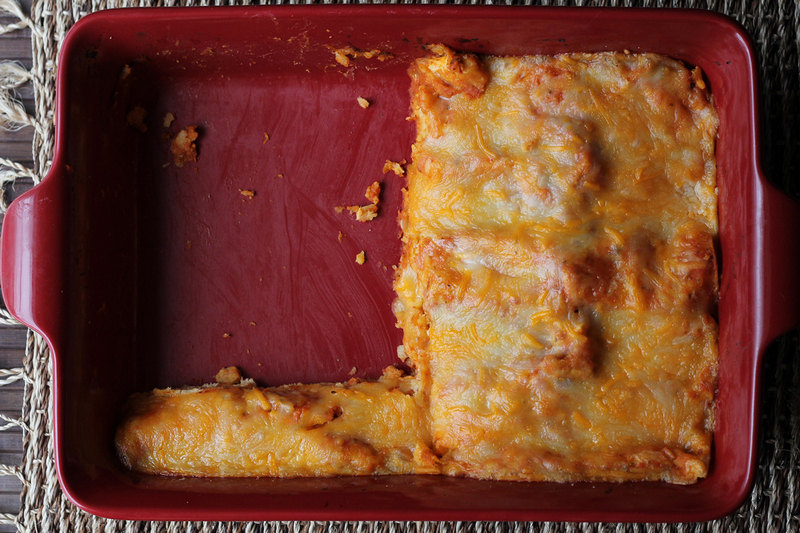 Heat the oven to 350 degrees and ladle a thin layer of the sauce into the bottom of a 9x13 baking pan. Dip each tortilla briefly into the sauce in the pan - this will soften it so they can bend without breaking. Fill each tortilla evenly with chicken and cheese - plan on using about half of the cheese in the tortillas and reserve the other half to top the enchiladas. Roll each tortilla as you fill it, and arrange them seam-side down in the pan. When you're done rolling, top the tortillas with the reserved cheese. Bake at 350 degrees until the cheese is melted and the enchiladas are warmed - just about 15 minutes. Serve with your favorite garnishes - I used guacamole and sour cream. In season, tomatoes would be nice - or whatever you like. *I had leftover roast chicken, so I used that instead - I didn't cook it in the sauce, but I did need to continue simmering the sauce until it was thick enough If I did that again, I'd use less chicken stock so I wouldn't need to simmer quite as long. And, here, I pickled the leftover peppers. Check it out! 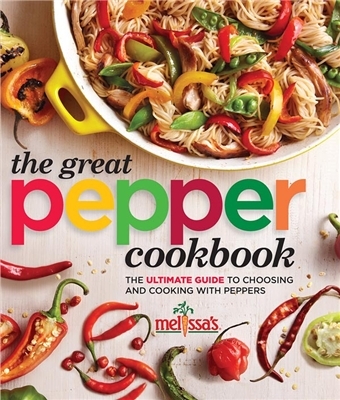 Melissa's provided me with the peppers and the cookbook at no cost to me.